This chapter covers capturing user input through the use of custom dialog boxes. We alsocontinue to demonstrate the use of adapters and an SQLite database. In this chapter, we complete the lab we began in Chapter 5.
one to clear out all reminders, and another to insert some reminders. There are several calls to the createReminder() method, each taking a String value with the reminder text and a boolean value flagging the reminder as important. We set a few values to true to provide a good visual effect. Click and drag a selection around all of the createReminder() calls and then press Ctrl+Alt+M | Cmd+Alt+M to bring up the Extract Method dialog box, as shown in Figure 6-1. This is one of many refactoring operations available both via the Refactor menu and via a shortcut key combination. 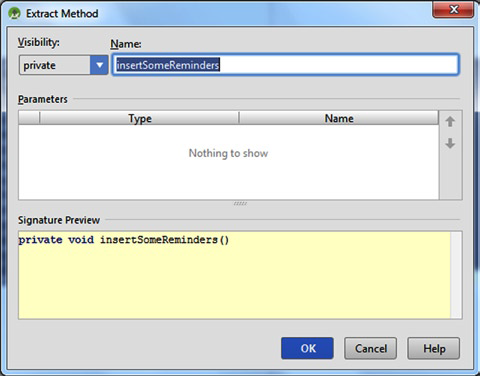 Enter insertSomeReminders as the name for the new method and press Enter. The code in RemindersActivity will be replaced by a call to the new method you named in the Extract Method dialog box, and the code will be moved into the body of this method. 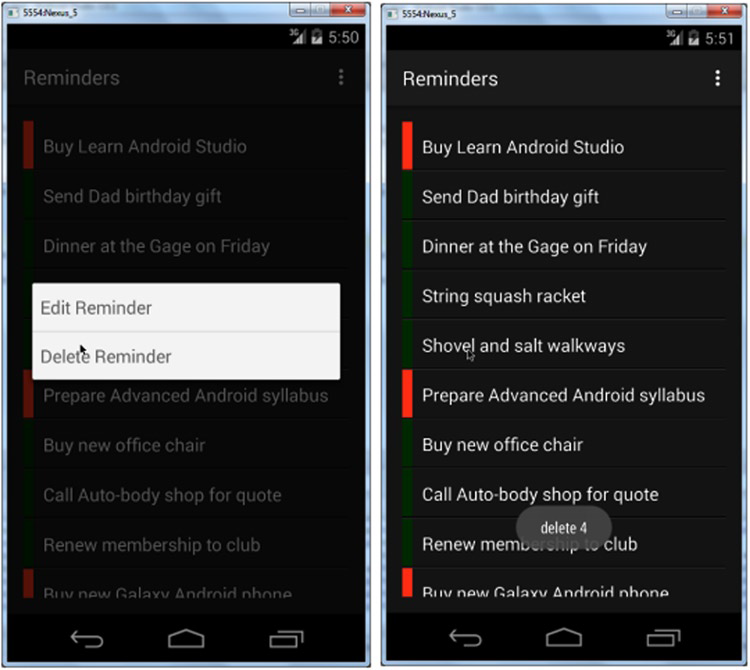 Run the app to see how the interface looks and behaves with the example reminders. Your app should look something like the screenshot in Figure 6-2. 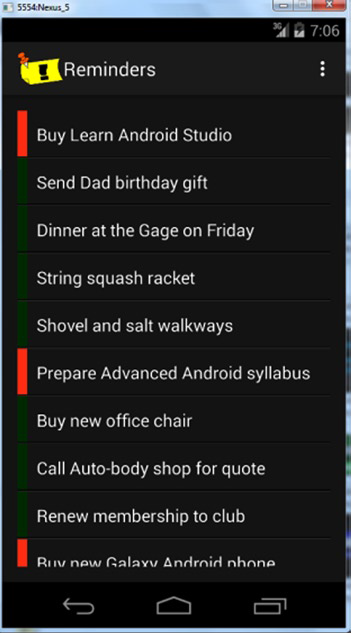 Some of the reminders should be displayed with a green row tab, while the ones marked important will be displayed with an orange tab. Commit your changes with the message Adds Example reminders. No app is of much use unless it responds to input. In this section, you will add logic to respond to touch events and eventually allow the user to edit the individual reminders. 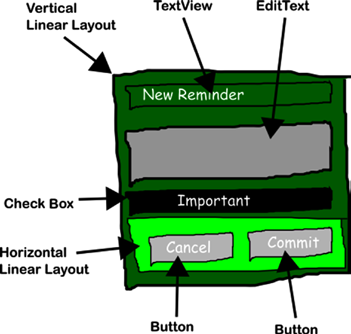 The main component in the app is ListView, a subclass of the Android View object. Up to this point, you haven’t done much with View objects other than place them in layouts. The android.view.View object is a superclass of all components that draw to the screen. the method. You can use Toast as a quick indicator that a method is being called properly, as shown in Listing 6-2. Note Toast messages may be hidden on certain devices. An alternate approach would be to log a message by using the Android logger, which is covered in detail in Chapter 12. Clicking the first item in the list invokes the onItemClick() method with a position that has the value 0 as elements in the list are indexed starting at zero. The logic then pops a toast with the text clicked and the position, as shown in Figure 6-3. With some familiarity of touch events, you can now enhance the click listener to show a dialog box. Replace the entire onItemClick() method with the code in Listing 6-3. When you resolve imports, please use the android.support.v7.app.AlertDialog class. 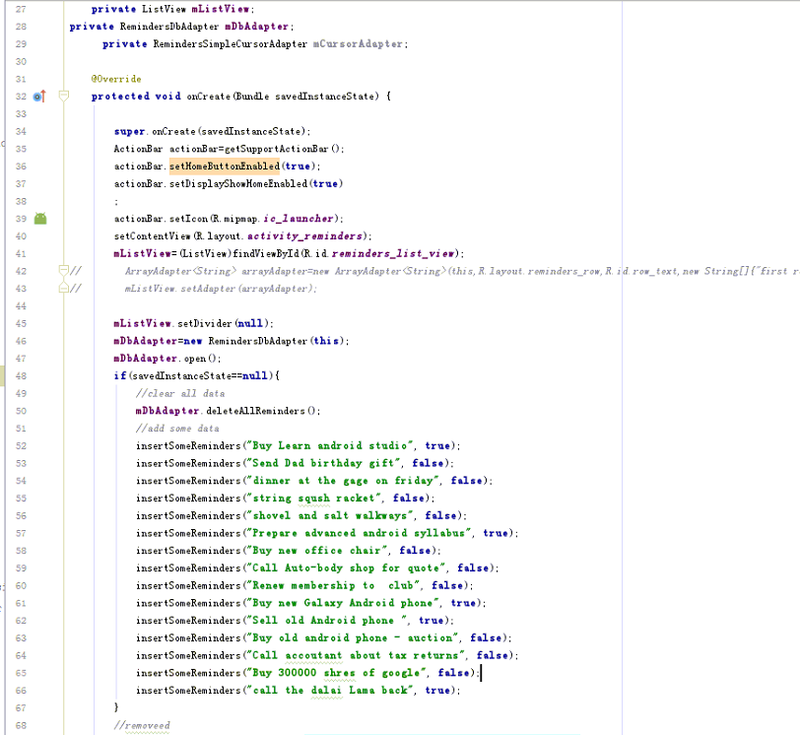 In the preceding code you see another Android class at work, AlertDialog.Builder. The class Builder is a nested static class inside the AlertDialog class, and it is used to build AlertDialog. The code in this lab so far creates a ListView and an ArrayAdapter to feed items to a ListView. You may recall this pattern from Chapter 5. The adapter is created with an array of two potential choices, Edit Reminder and Delete Reminder, before being passed to ListView, which is, in turn, passed to AlertDialog.Builder. 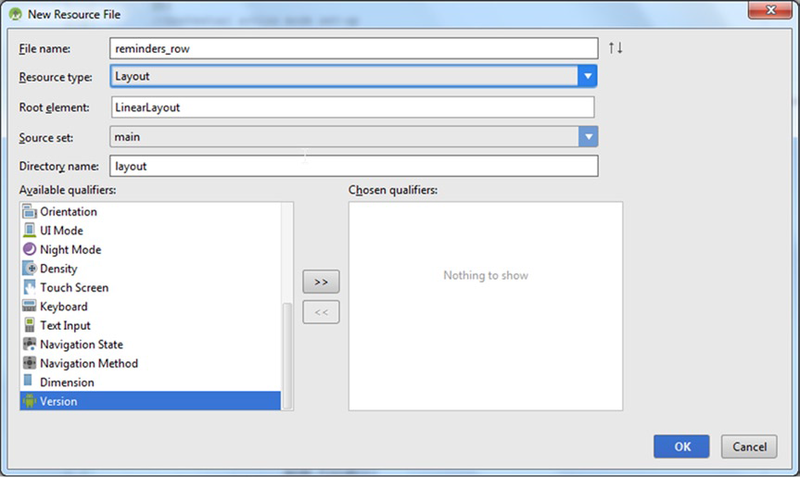 The builder is then used to create and show a dialog box with the list of choices. Pay careful attention to the last section of code in the Listing 6-3. It is similar to the OnItemClickListener() code added earlier; however, we are attaching a click listener to the modeListView that was created inside the current OnItemClickListener. What you see is a ListView with an OnItemClickListener that creates another modeListView and another nested OnItemClickListener to respond to tap events for the modeListView. click listener, which removes the dialog box completely. Test the new feature shown in Figure 6-4 by running it on your device or emulator. Tap a reminder and then tap either Edit Reminder or Delete Reminder from the new pop-up dialog box. If the position of the reminder reported in the toast does not match the reminder you tapped, double-check that you are appending the masterListPosition value to the text in your toast and not using position. Press Ctrl+K | Cmd+K to commit this logic and use the message Adds a ListView dialog for individual list items. With the app beginning to take shape, you will now attack a feature that allows multiple reminders to be edited in one operation. This feature is available only on devices running API 11 and higher. You will make this feature conditionally available in the app by using the resource-loading conventions. This process is explained later in this chapter and in detail in Chapter 8. You will also need to include a check at runtime to decide whether to enable the feature. 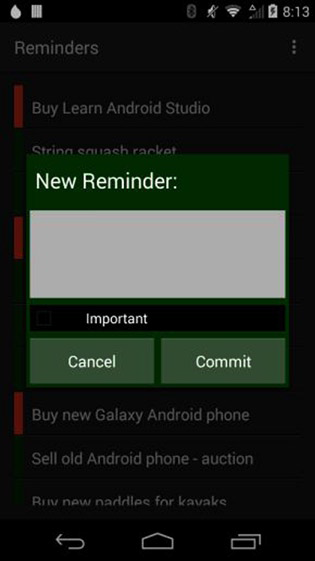 Start by creating an alternate layout for the reminder row items. Open the Project tool window and right-click the res folder to bring up a context menu. 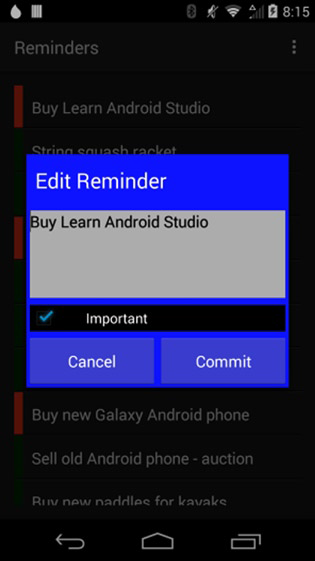 Choose New Android Resource File from the menu and enter reminders_row as the name in the dialog box, as shown in Figure 6-5. (or click OK) to accept this new resource-qualified directory and continue. 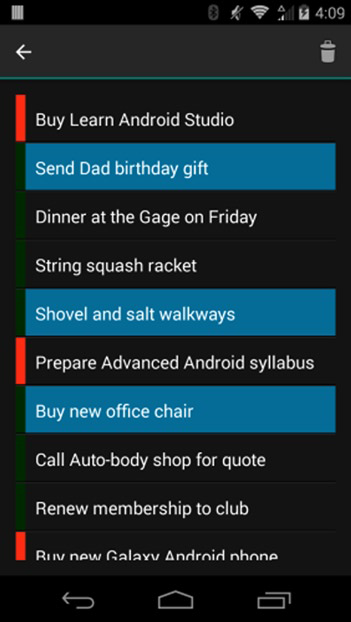 If you open the Project tool window and set its view to Android as in Figure 6-6, you will see both reminders_row layout files grouped together under the layout folder. Again, the Android view of the project window groups related files together to allow you to efficiently manage them. This value assigned to the background attribute is prefixed with ?android:attr/, which refers to a style defined in the Android SDK. The Android SDK provides many such predefined attributres, and you may use them in your app. The activatedBackgroundIndicator attribute uses the system-defined color for the background of items activated during multiselect mode. Now you will learn how to introduce a platform-dependent feature. Open the Project tool window and open the build.gradle file for the app module under the Gradle Scripts section (It will be the second entry). These Gradle files hold the build logic for compiling and packaging the app. All the configuration regarding which platforms your app supports is located in these special files (Chapter 13 explores the Gradle build system in depth). Notice that the minSdkVersion is set to 8 which allows your app to run on 99%+ of all Android devices. The feature we are about to create requires a minimum SDK (aka API) version of 11. The code and features we cover in this section will allow users running version SDK 11 or higher to take advantage of a feature called contextual action mode. Furthermore, those running an SDK version less than 11 will not see this feature, but more importantly, their app will not crash. this way. The android namespace is where all of the built-in Android values are located. Within this namespace are various resource locations such as drawable, string, and layout. When you use the special @+id prefix, it creates a new ID in your project’s R.java file, and when you use the @id prefix, it looks for an existing ID in the R.java file of the Android SDK. This example defines a new ID name, menu_item_delete_reminder, which is associated with the menuoption. 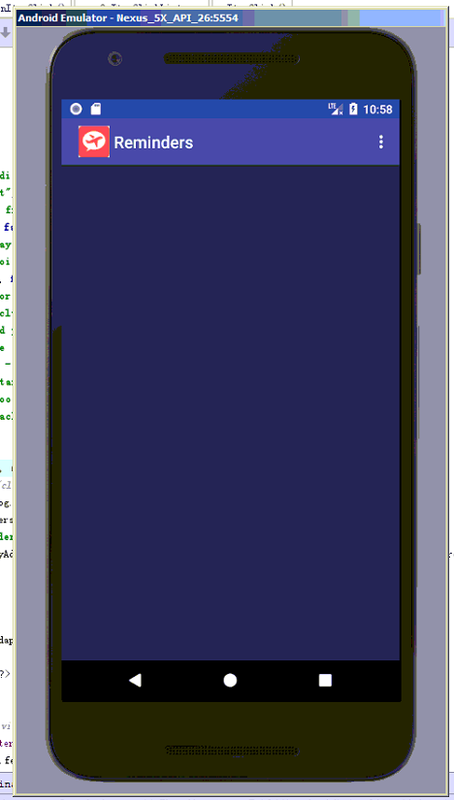 It also pulls an icon out of the android:drawable namespace, which is used as its icon. The Build class is imported from the android.os package and gives you access to a set of constant values that can be used to match a device with a specific API level. 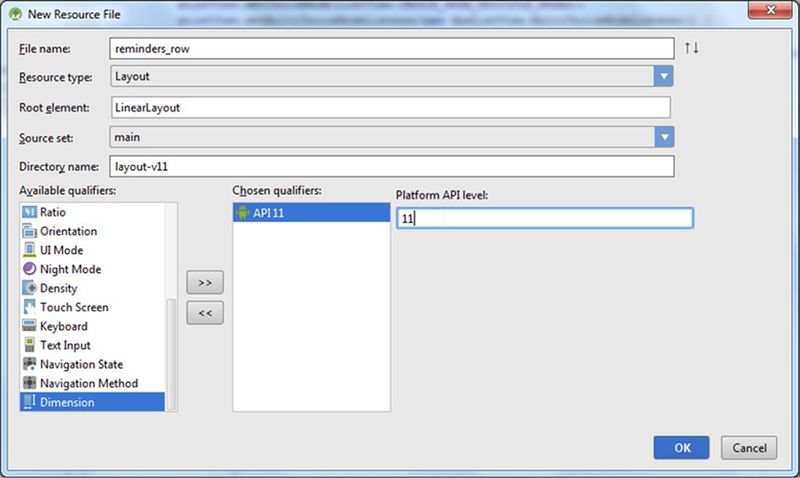 In this case, you are expecting the API level to be at or above HONEYCOMB which contains an integer value of 11. Insert the code in Listing 6-4 inside the if block you just defined. The if block protects devices that are running an OS less than Honeycomb without which the app would crash. Resolve any imports. You will notice that getIdFromPositon() is not defined and is flagged red. Place your cursor on the method and press Alt+Enter to invoke IntelliSense and select Create Method. Select RemindersActivity as the target class. Select int as the return value.Decorate the method as seen in Listing 6-5. The preceding logic defines a MultiChoiceModeListener and attaches it to the ListView. Whenever you long-press an item in the ListView, the runtime invokes the onCreateActionMode() method on the MultiChoiceModeListener. If the method returns with the boolean true value, multichoice action mode is entered. The logic in the overridden method here inflates a context menu that is displayed in the action bar when in this mode. The benefit of using multichoice action mode is that you can select multiple rows. One tap selects the item, and a subsequent tap deselects the item. As you tap each of the items from the context menu, the runtime will invoke the onActionItemClicked() method with the menu item that was tapped. In this method, you check to see whether the delete item was tapped by comparing the itemId with the id of the delete element you added to the menu item. (See the XML listing at the start of this section for a description of the delete item’s ID.) If the item is selected, you loop over each of the list items and request that mDbAdapter delete them. After deleting the selected items, the logic invokes finish() on the ActionMode object, which will disable multiselect action mode and return the ListView to its normal state. Next you invoke fetchAllReminders() to reload all the reminders from the database and pass the cursor returned from that call to the changeCursor method on the mCursorAdapter object. Finally, the method returns true to indicate that the action has been properly handled. In every other case where the logic is not handled, the method returns false, indicating that some other event listener can handle the tap event. This special annotation tells Lint to treat the method call as targeting the supplied API level regardless of what the build configuration specifies. Commit your changes to Git with the message Adds Contextual Action Mode with context action menu. Figure 6-7 depicts what you might see when you build and run the app to test the new feature. So far, you have added logic to delete reminders from the list. This logic is available exclusively in contextual action mode. You currently have no way to either insert new reminders or modify existing reminders. 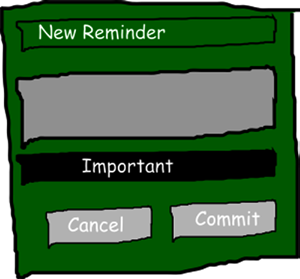 However, you will now create a custom dialog box to add reminders, and another to edit existing reminders. Eventually, you will bind these dialog boxes to RemindersDbAdapter. Note Typically, you would have an overall color theme for your app, which would ensure consistency between all screens and dialog boxes. However, color theme is beyond the scope of this simple lab. A good habit to develop is to sketch your UI by using simple tools prior to implementing it. Doing so allows you to visualize how elements will fit on the screen prior to investing any code. You can use an editor such as Inkscape, which works across platforms, or you can use something as simple as notebook paper and a pencil. In the mobile business, these sketches are called wireframes. Figure 6-8 is an illustration of our custom dialog box done with Inkscape. The wireframe is intentionally informal, to emphasize the placement of components rather than a specific look and feel. Note Some of the custom artwork and wireframes in this book were created using Inkscape, a multiplatform vector graphics editor. It is freely available at www.inkscape.org. With the wireframe in place, you can start planning how to line-up the components on-screen. Since most components flow from top to bottom, using a vertical LinearLayout for the outermost container is an obvious choice. However, the two buttons at the bottom are side by side. For these you could use a horizontal LinearLayout and nest it inside the containing vertical LinearLayout. Figure 6-9 adds annotations to the drawing and highlights this nested component. will use in the Java code. You will now use the completed dialog layout in RemindersActivity. Listing 6-7 is an implementation of a new fireCustomDialog() method. Place this code in the RemindersActivity.java file, just above the onCreateOptionsMenu() method and resolve imports. The fireCustomDialog( ) method will be used for both inserts and edits, since there is little difference between both operations. The first three lines of the method create an Android dialog box with no title and inflate the layout from Listing 6-6. The fireCustomDialog( ) method then finds all of the important elements from this layout and stores them in local variables. Then the method sets an isEditOperation boolean variable by checking whether the reminder parameter is null. If there is a reminder passed in (or if the value is not null), the method assumes that this is not an edit operation and the variable is set to false; otherwise, it is set to true. If the call to fireCustomDialog( ) is an edit operation, the title is set to Edit Reminder while the CheckBox and EditText are set using values from the reminder parameter. The method also sets the background of the outermost container layout to blue, in order to visually distinguish an edit dialog box from in insert dialog box. The next several lines compose a block of code that sets and defines an OnClickListener for the Commit button. This listener responds to click events on the Commit button by updating the database. Again, the isEditOperation() is checked, and if an edit operation is underway, then a new reminder is created by using the ID from the reminder parameter and the values from the EditText and on-screen check-box value. This reminder is passed to mDbAdapter by using the updateReminder() method. If an edit is not underway, the logic asks mDbAdapter to create a new reminder in the database by using the values from the EditText and on-screen check-box value. After either the update or create call is invoked, the reminders are reloaded by using the mCursorAdapter. changeCursor() method. This is logic similar to that which you added earlier in Listing 6-5. 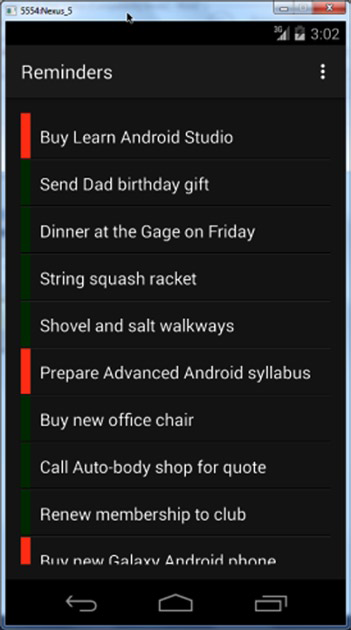 The click listener dismisses the dialog box after the reminders are reloaded. After configuring the click behavior of the Commit button, the example sets another click listener for the Cancel button. This listener simply dismisses the dialog box. With the behavior for both of these buttons specified, the example concludes by showing the custom dialog box. To edit a reminder, you replace the Toast.makeText() call with a call to find the reminder by using the ListView position. This reminder is then passed to the fireCustomDialog() method to trigger the edit behavior. To delete a reminder, you use logic identical to that you added in Listing 6-5 during multichoice mode. Again, mDbAdapter.deleteReminderById() is used to delete the reminder, and the changeCursor() method is used with the cursor returned from the mDbAdapter.fetchAllReminders() call. Find the onOptionsItemSelected() method at the very bottom of the RemindersActivity.java file and modify it to look like Listing 6-8. Here you simply add a call to fireCustomDialog() when the selected menu item is action_new item. You pass null to the method, as the logic covered earlier checks for a null value and sets the isEditOperation to false and thus invoking a New Reminder dialog box. Run the app and test the new feature. You should be able to see the new custom dialog boxes. You will see a green dialog box when you create a reminder, and a blue dialog box when you edit a reminder, as shown in Figure 6-10 and Figure 6-11 respectively. Test the menu items to make sure that the creating and deleting operations function as they should. Commit your changes to Git with a commit message of Adds database Create, Read, Update, and Delete support with custom dialogs. With all of the features in place, you can add a custom icon as the finishing touch. You can use any image editor to create an icon or, if you are not graphically inclined, find some royalty-free clip art on the Web. 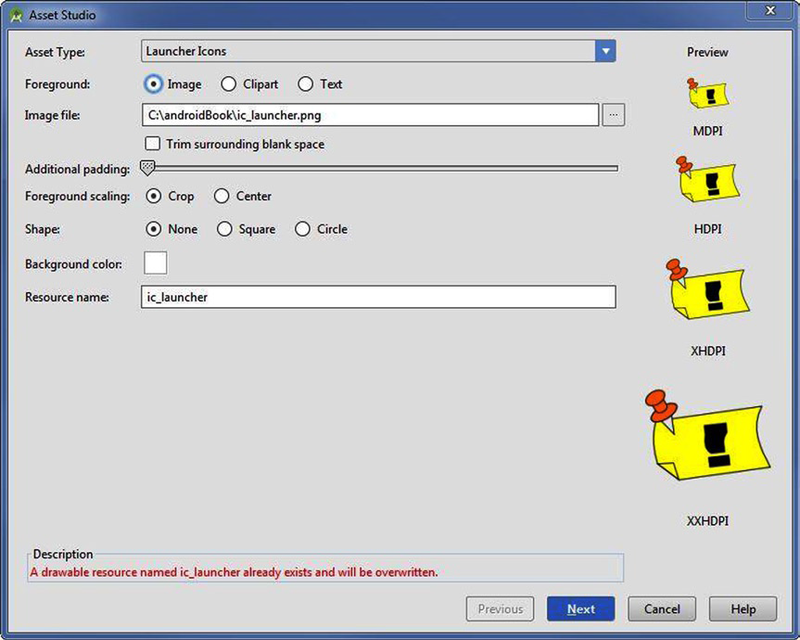 Our example replaces the ic_launcher icon with custom artwork created in Inkscape. Open the Project tool window and right-click the res/mipmap directory. Now select New ➤ Image Asset. You will see a dialog box like Figure 6-12. Click the elipses button located on the far right of the Image file: field and navigate to the location of the image asset you crated. Leave the rest of the settings as they appear inFigure 6-13. Now click Next, and in the subsequent dialog box click Finish. There are a number of folders with the name mipmap. These folders each have suffixes that are designated screen-size qualifiers. The Android runtime will pull resources out of a particular folder, depending on the screen resolution of the device on which the app is running. Resource folders and their suffixes are covered in more detail in Chapter 8. When you run the code, you will see your custom icon in the Action Bar. Figure 6-13 shows an example of the app running with the custom icon. Press Ctrl+K | Cmd+K and commit your changes with the message Adds a custom icon. Congatulations! 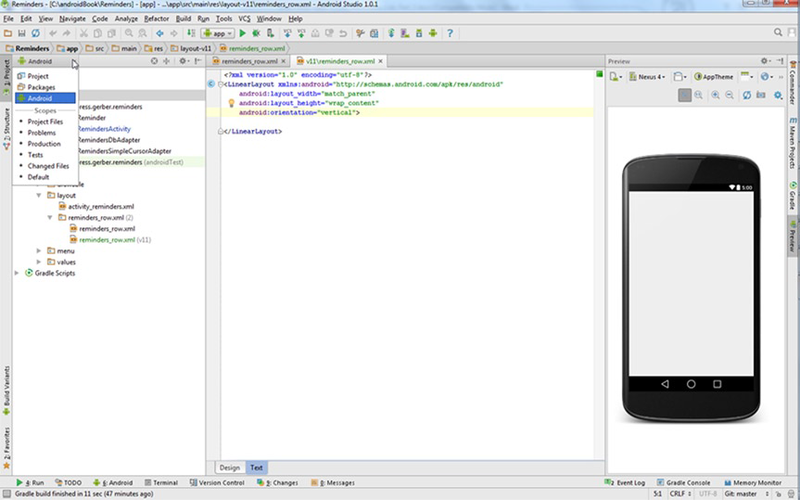 You have implemented your very first Android app using Android Studio. In the process, you learned how to edit XML layouts using the Visual Designer. You also learned how to edit raw XML using the Text mode. The chapter showed you how to conditionally implement Contextual Action Mode on platforms that support the feature. Finally, you saw how to add a custom icon for various screen densities.